Effective insulation makes heating faster - retains wamrth longer after the heat has been turned off! There are different ways to insulate a hot tub. Both in the design itself and in choice of insulation material. For an effective "complete insulation" it is required that the bottom and side are insulated with material of sufficiently good insulation value. It is not enough merely to have insulation under the seats, these designs are infact primarily designed to prevent sagging rather than to insulate the tub. Moreover, an insulated cover is required. In addition, one should not forget to protect equipment on the outside, such as stoves, pumps, hoses and filtration systems. SpaDealers are experts at this! See examples here! The diagram shows heatign with a gas heater for City-Tub Arctic. the blue line is the temperature of the water at bench height. 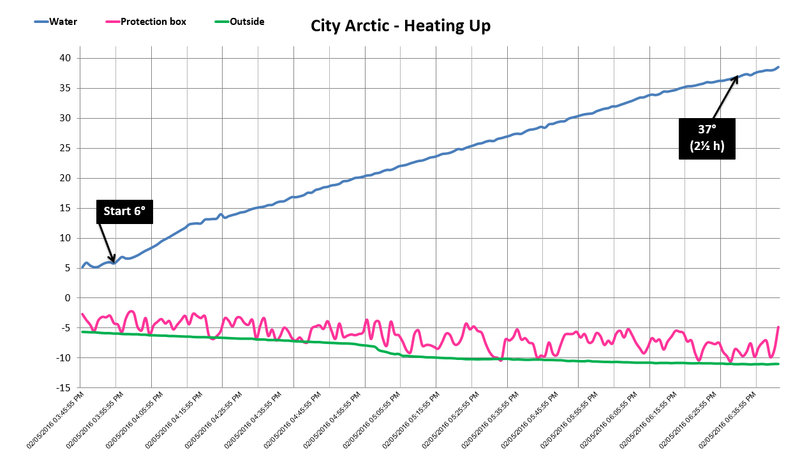 The purple line shows the temperature in the protective box that houses the gas heater during the heating phase. 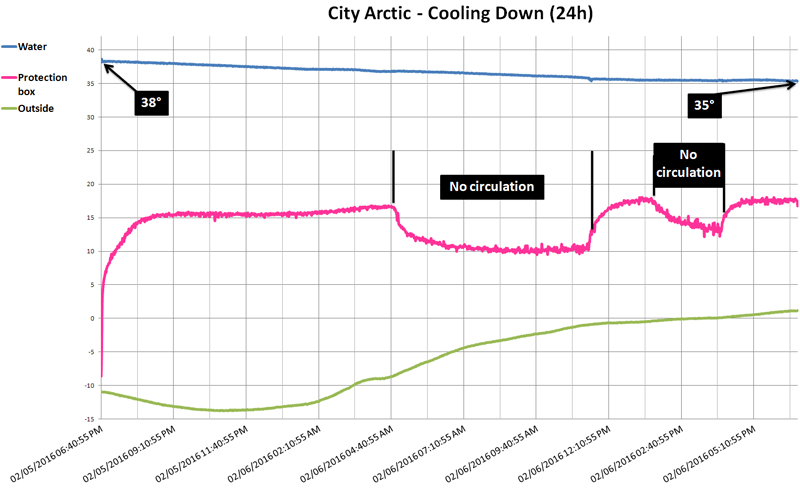 The green line shows the outside temperature. This model is recommended for urban locations. Fast heating, great for when you want to take a dip without having to plan ahead and spend a long time waiting for the tub to warm. With the aid of an AquaClarus filtration system the same water can be used for longer and gas consumtpion for repeated reheatings is reduced. The test Cooling Down below, shows the temperature drops about 3 degrees centigrade in 24 hours. This is equivalent to 0,4 kg of propane and about 15 minutes reheating time. the blue line is the temperature of the water. The purple line shows the temperature in the protective box that houses the gas heater, sensor is placed 20cm from the bottom. The diagram shows how the water temperature is cooled and the how temperature of the protective shelf is affected by the stoppig of the heater. The protective lid is in place, the circulation pump is cycling on and off in regular intervalls. The model is the insulated City-Tub Arctic which is also equipped with an insulated cover. The test lasted for 24 hours, showing little change in water tempertaure. The temperature inside the protection shelf is also kept well above freezing. We dare say that our isolation principle is the best on the market. The sections marked "No Circulation" means the circulation pump has been turned off. This is of signifigance for the protective box where the stove is located as the temperature inside drops then. We therefore recommend that the circulation be kept in continuous operation if the outdoor temperature is below 0 degrees celcius.